While novelization has fallen out of favor, you can still find plenty of books that have been adapted into movies where the movie posters serve as covers. But those don’t have any style. They’re just generic marketing. Tim Anderson, a Salt Lake City concept designer for Electronic Arts, has rendered a few of his favorite sci-fi films as old school pulp novels. One for the Wachowski’s The Matrix appeared a while back, but two more have popped up. It’s good to live in a world where people have a lot of time on their hands. Why? Because that means that artists like Sweden’s Anders Ramsell have time to do things like animate the opening sequence of Ridley Scott’s science fiction classic Blade Runner entirely in watercolors. With the release of Prometheus nearly upon us, Ridley Scott is seemingly everywhere, talking up a storm. 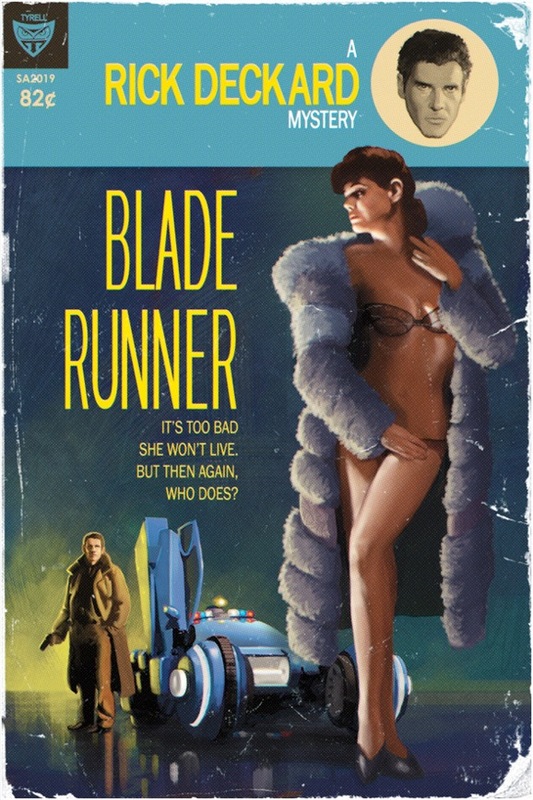 While the subject is primarily the film about to drop, his return to the halls of science fiction, there’s also been a great deal of discussion about revisiting another of his beloved classics, in the form of a Blade Runner sequel. We’ve all been thinking—and drooling—about this, and obviously so has Scott. In a recent interview he mapped out a potential scene from a theoretical new Blade Runner movie. Amidst the massive PR push for Prometheus, a campaign almost as epic as the film itself, bits of news about Ridley Scott’s possible Blade Runner sequel continue to float to the surface. From what we’ve heard so far, Scott’s return to another of his most beloved sci-fi universes will be a sequel not a prequel—set years after the events of Blade Runner—that original screenwriter Hampton Fancher is in talks to tackle the script, and the film will likely feature a female protagonist. Amusing is not exactly how I would have put it, but can’t you just hear the cheers in the theater at a midnight screening of Blade Runner 2 as Harrison Ford pops up for a quick line or two. Maybe Scott doesn’t even envision Ford as Deckard, maybe he’ll toss him in as a supply clerk or grizzled bartender. At this point everything is so up in the air that it’s all wild conjecture, but what the hell, conjecture is fun, and a Blade Runner movie won’t feel like a Blade Runner movie without a few frames of Ford.